Why is ABUS Audio Still Going Strong? We started offering ABUS whole house audio at the beginning of 2005. ABUS is a licensed technology that must be followed to the exact specifications as the licensee. ABUS is an analog line level system on Cat5 with keypads in each room that are true amplifiers with speaker level output using minimal speaker lengths to a pair of speakers per keypad and a hub pushing the line level audio/IR and 24 Volts to each amp/keypad. Contrary to those whom never heard it assume ABUS is background audio is furthest from the truth. Yet why has the cost of ABUS products maintained its value since the release? The average cost for the amplified keypad was around $110.00 when released and still is today. I must say, with the lower cost of Plasma and LCD TVs today, they have basically dropped to a disposal able product along with most all electronics. My professional opinion regarding ABUS maintaining its value has a lot to do with ABUS' ability to have local inputs in each room weather it’s a docking station for an iPod / iPhone or a single gang line level RCA plate for any local line level source that will override the whole house audio that inputs into the main hub single source hub or multi source, ABUS hubs distributes 4 amp/keypads per hub. In short when you walk into a room with ABUS whole house audio playing, you dock your iPod / iPhone which in turn stops the whole house audio in that room, once the iPod / iPhone is removed the whole house audio will resume. The simplicity factor plays a huge roll, even for the youngest of audio listeners. 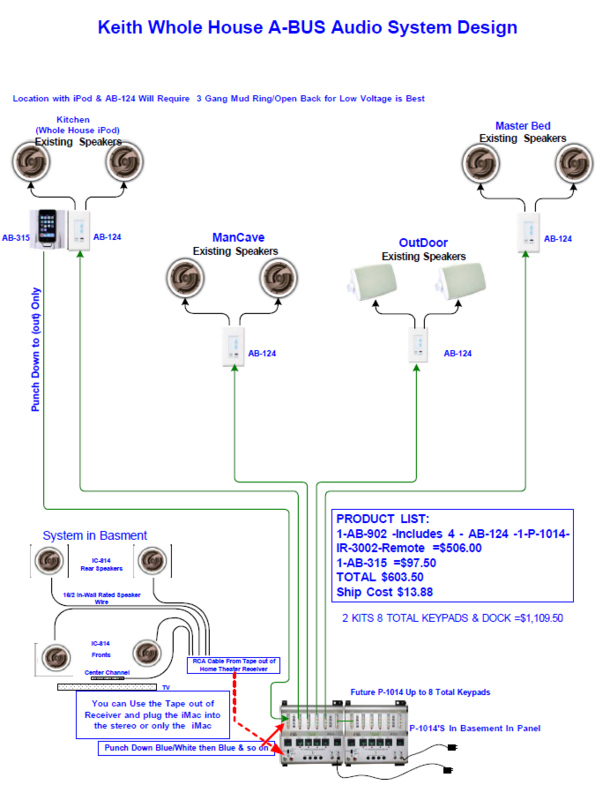 When it comes to discussing the power output of a distributed audio system, it is important to understand what is being discussed. Is the question appropriate for answer the enquirer is asking for? For example: The Mini Cooper is a popular new vehicle, as is the new Ford F- 150 pick-up. Have you ever heard the topic of payload mentioned when discussing the Mini? Conversely have you ever heard of the topic of handling being discussed when talking about the Ford? And it would be very wrong to compare them simple by quoting the power output of their motors. In the seventies when we started experimenting with speaker cable we found that the cable could make big differences in the sonic performance of a Hi-Fi system. But despite what we heard with our ears the technical elite refused to accept the fact that it made a difference because they could not measure these differences on a piece of paper. Magazines also refused to review them and while a large industry grew up making speaker and interconnect cables, many, most of who were technical, stuck their head into the ground and ignored what was obvious to the average listener. Let’s face it, our ears are the final judge. With A-BUS it is no different; let your ear be the judge. While all the skeptics want to argue about the power output of A-BUS, those using it in the field are having no trouble. It seems that history is repeating itself most of the critics are the ones that have never heard it for themselves. A-BUS sounds better and it is not because of power. It’s because of delivery of better quality signal to the local rooms or zones. There are two ways of looking at the power question. One is from a historical point of view. The other is whether it is appropriate to use the power output of a system to judge the quality of a sound system. In the 1970’s and 1980’s many speaker designers traded speaker efficiency to get improved sound quality. Loudspeakers were being designed where the previously typical 90dB efficiency often got down to 84db. Additionally, crossovers on some speakers that claimed a nominal impedance of 8 ohms magnified the problem by going down to impedances as low as 2 ohms at some frequencies. And what might seem like a simple solution to increase the power output of the amplifier was just not that simple. For example, if you have a 50 watt amplifier rated at 8 ohms, put a 2-ohm load on it and it will want to deliver upwards of 200 watts. The problem is it can’t because the amplifier’s power supply was only designed to deliver 50 watts or there-about. But if the designer increased the size of the power supply, which is quite costly, to handle a difficult 2 ohm load, it was not expensive to increase the power output at the same time. It is like a catch 22 puzzle the real reason for the expansion of power is rarely understood and too difficult to explain to the average consumer. Watts by themselves may not be an accurate way to measure an amplifier’s quality but weighing it can be a good alternative. Good power supplies are rarely light. In the 1990’s the tables turned, speaker designers had to respond to the limitations of mass market amplifiers that could not deliver the flexibility they required. The average efficiency of speakers has come back up, (ie. many speakers are now ported again and floor standing speakers have largely replaced boxed speakers on stands) and impedance curves in general are not so demanding. It’s a good thing, because the weight of amplifiers has not increased over the last 25 years and rather than putting out 2x power they are now putting out 5x power. What are the Parameters for Multi-Room Audio? With multi-room audio we need to re-examine the parameters we are working with and their importance. Is power really our problem? No, most in wall speakers are around 90dB efficient, their impedance curves are not an area of concern and they are generally 8ohms. Once you install long runs of speaker cable in a wall there is no panacea, you cannot correct what is lost going down the line. And when you try to counter the problem with better speakers then there is little that can be achieved because the losses have already occurred down the line. OK you can install better speaker cables but it is really like putting a band-aid on what is essentially a festering sore. All too often in these situations people are turning the volume up to compensate for the lack of clarity. The result is irritating music that no one listens to for long period and after the newness wears off these systems are rarely used. Why is A-BUS such a Great Solution? If you understand the problems the speaker cables present to a sound system whether they be short or long the best solution is to get the amplifier as close as possible to the speaker. Running long runs of line level signal offer little trouble in comparison, here our problem is mainly hum and noise. Category 5 cable offers a real solution here as an audio signal places little demand on it in compared to the real purpose it was designed for. When you have installed an A-BUS system and tested it, you quickly find it does not lack power either. It is not a weakness of the system as there is plenty of good clean power available for today’s efficient “In Wall” loudspeakers. Is the amount of volume important in the bedroom bathroom or kitchen? In most cases the answer is no! The clarity of sound on the other hand is important. Around the home you are looking to complement your activities, the sound needs to be relaxing and entertaining not invasive or irritating. So perhaps the real test is not how good the sound is at high volume it is how good the sound is at low volume. However, if you are looking for high volume outdoors, for instance, it is never an easy problem but it is an area where A-BUS has a lot of advantages. With an A-BUS pre-wire we are sending a high quality signal to every room, if there is a requirement for high power (a kids rumpus room could be another example), A-BUS becomes the line level signal source for a local amplifier. A-BUS power modules can also work with sub-woofers to increase the dynamics of the music. But most importantly wherever you are in the house the signal source with A-BUS is at its best. So, when someone questions the power output of a distributed audio system, think carefully about why the question is asked before you respond with an answer which is really misleading. It is really better not to quote the output at all.